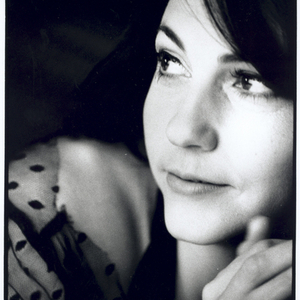 Lisa Germano is a multi-instrumentalist, singer, writer and arranger from Mishawaka, Indiana. After years playing violin as a session musician with the likes of John Mellencamp, Indigo Girls and Bob Dylan, Germano embarked on a solo career in 1991 with the understated but occasionally brilliant On the Way Down From the Moon Palace on her own label, which led to a deal with Capitol, who released her second album. After years playing violin as a session musician with the likes of John Mellencamp, Indigo Girls and Bob Dylan, Germano embarked on a solo career in 1991 with the understated but occasionally brilliant On the Way Down From the Moon Palace on her own label, which led to a deal with Capitol, who released her second album. Although Happiness was a massive step up in terms of confidence and songwriting, troubles at the label led to her buying back the rights. In 1994 4AD released a re-sequenced and remixed version of Happiness with a new sleeve and a few different tracks (including a gloomy version of the formerly scintillating ?... Dresses'). She turned out to be not just a great musician (she plays most of the instruments: piano, guitar, percussion and tape effects, as well as her trademark violin) and a wittily melancholy if kooky songwriter (?I Love A Snot', indeed), but a phenomenal arranger whose innovation and breadth of expression is comparable to PJ Harvey at her tape-mangling best. As her style developed, so the music's potential commercial appeal increased without compromising its uniqueness. Bright kaleidoscopes during an otherwise dark time in 4AD's history, the following three albums, Geek the Girl, Excerpts from a Love Circus and Slide all won critical acclaim, but sadly failed to reach the wide audience they deserved; Germano was dropped in 1998, and announced her retirement from the music business. (In 1997, she also released a collaboration with Giant Sand and future members of Calexico under the name OP8 Featuring The Ilk Of Lisa Germano). Retirement didn't suit her, and she was soon out on tour again, sessioning for David Bowie and Neil Finn, before, in 2003, releasing the self-funded lullaby for liquid pig on ArtistDIRECT imprint Ineffable. A return to the woozy, after-the-carnival soundworld of ...Love Circus, the album was made with help from collaborators Finn, Johnny Marr and Wendy Melvoin. Label-less again after Ineffable dissolved, Swans mainstay and longtime Germano fan Michael Gira snapped her up for his Young God label, which in 2007 released In the Maybe World, a stripped-down but ultimately hopeful reflection on mortality inspired by the death of, well, a cat, but also the imagined death of her Father. Young God subsequently reissued Liquid Pig with an extra CD of live recordings and demos, whose between-song banter highlighted Germano's unique and cat-slanted take on life and death. In September 2009 the album Magic Neighbor was released, again on Young God Records.